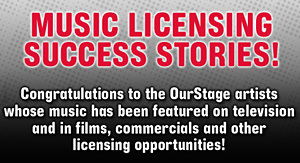 OurStage is partnering with the legendary Ernie Ball in 2013 to host three incredible competitions for emerging Rock, Pop and Country artists. We'll kick off a competition for each genre, awarding one finalist from each with a year's supply of Ernie Ball strings and accessories, plus editorial coverage from OurStage. This time, we're looking for the hottest ROCK act out there. Enter your best rock song in the Ernie Ball "Save Your Strings" Competition by August 23rd for a chance to win. OurStage fans will rank the best entries, and Ernie Ball will select a winner. Get to it. At the end of the year, one Grand Prize winner will be selected from among the finalists to win an Ernie Ball endorsement deal and a Music Man guitar or bass of their choosing for EACH guitarist in the band! Participants must be thirteen (13) years of age or older at time of entry and must reside within the contiguous United States. *Only submission materials that are determined, at the sole discretion of the Sponsors, to be classified as Alternative Rock, Folk Rock, Hard Rock, Indie Rock, Metal, Modern Rock, Punk, Rock, and Soft Rock, as defined on the OurStage FAQs, will be deemed valid entries. Click here to view the competition FAQs. Click here to view the official rules.